College Club is a college prep program for 1st through 12th grade students that is built on a foundation of academic tutoring, monitoring and case management. Focusing on topics like goal setting, college entry, understanding financial aid, career development and life skills, College Club creates a safe space where students can feel validated and recognized as individuals with unique life experiences. Education Coordinators work with each student to set academic and personal goals to work toward throughout their time in College Club and beyond. They also connect students’ families to community resources in the hopes of removing any social and/or economic barriers interfering with a student’s education. For their active engagement and progress, College Club members are rewarded with prizes, field trips and service-learning projects. Providing students with these services in a safe and open environment is crucial to our strategic goal to graduate 90% of our members from high school ready for post-secondary opportunities. As GPAs grow, so does our cohort of students. College Club currently serves around 300 students from 1st through 12th grade across Dane County. College Club at the Allied and Taft Boys & Girls Clubs functions as an after-school program for students in grades 1-8. The ultimate goal of the club is to equip every member with the academic and personal tools they need to graduate from high school and be prepared for college success. AVID/College Club, a partnership between The Boys & Girls Club and MMSD, supports 7th and 8th grade AVID students in the classroom. Boys & Girls Club staff stationed at both Wright and Cherokee Middle Schools collaborate with school staff to best serve the AVID/College Club students. 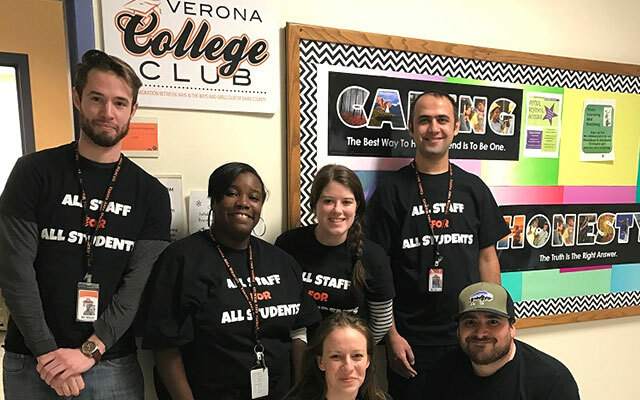 The Verona High School College Club was founded in 2012 to support low-income students and students of color struggling with academic performance, school attendance and overall behavior in grades 9-12. The club immerses students in tutoring, mentoring, case management, family outreach and college preparation activities, creating a safe space for students with committed professionals to support them as they navigate the challenges of high school.